NYTimes Finally Covers Jill Stein! Throughout 2012, The Caucus will occasionally pose five questions to individuals from across the political spectrum who have special insight into government, policy making and political combat. If there is someone you think should be interviewed, let us know in the comment section below, or send me an e-mail at michael.shear@nytimes.com. 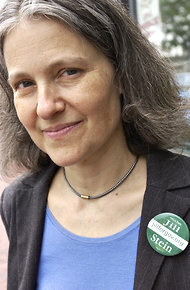 This week’s subject is Jill Stein, a candidate for the Green Party’s presidential nomination. Ms. Stein, a former physician and teacher of internal medicine, writes and speaks about the connections between the environment and health. She ran for governor of Massachusetts in 2002 against Mitt Romney. A. We are in crisis and people are losing their jobs and their homes and their health care and affordable higher education and civil liberties. You name it, they are losing it. We have got a 1 percent that’s rolling in dough as much as ever and the political establishment is not fixing it. The establishment got us into this mess, in both parties. And that’s clear as day. Over 10 years, I have been a recalcitrant political challenger, a recurrent alternative that would not go away. Q. Is your campaign trying to tap into the Occupy movement? A. Occupy is very much a part of a broader move for democracy and economic and social justice. That is alive and well around the world. Just look at what is going on in Wisconsin which is directly linked to Occupy. It doesn’t have the name of Occupy, but they slept for three weeks in the statehouse. If that’s not Occupy, what is? The Occupy movement, beneath the surface, represents a political coming of age of a younger generation who have been on the receiving end of a generally exploitative economy. One of those groups to exploit has been young people. They have been exploited in education. The unemployment crisis hits them the hardest. They are bearing the burden for the climate disruptions that are coming down the pike. Q. Does President Obama deserve credit for health care and other accomplishments? A. Small time, sure. There are minor improvements. But on the other hand, he took single-payer off the table. He absolutely took a public option off the table. As we found on issue after issue — the war, reappointing George Bush’s secretary of defense, sticking to George Bush’s timeline on Iraq, expanding the war, expanding the drone wars all over the place. And how about bringing Wall Street in, the guys who created the problem, among his first appointments. It was pretty clear right then that this was going to be business as usual on steroids. We’re certainly not more secure, more equitable, more healthy or safer internationally, with what Obama has brought. Q. What do you think of Mitt Romney? A. He responds to his electorate. When he’s running in Salt Lake, he’s anti-abortion. When he’s running in Massachusetts, he’s pro-abortion. He responds to his electorate, broadly, except that he remains basically pro-business in a very narrow sense of the word — that is a pro-one-percent big, corporate multinational business. You know what, that’s not so different from the way Larry Summers and Tim Geithner are running the country under Barack Obama. When our governorship changed from Mitt Romney and it went directly to Deval Patrick, who is another poster child for progressive Democrats, no difference. Nothing detectable. Nothing changed in Massachusetts whatsoever. Q. Is there a difference between the Democratic and Republican Parties? A. You might look at one party as a rapidly sinking ship and say we’re going to vote for the other guy because the ship’s not going down so fast. We don’t like him but he’s not sinking the ship so fast. But the real question is, if both of those ships are heading for the bottom of the ocean, do you want to be on either of them? No. There’s no question about where those ships are heading if you are looking at the economy.